With the long weekend in play there wasn't much updating activity amongst the Stockcharters, but it was a busy week for the market. Maurice Walker is looking for the Dark Cloud Pattern in oil to bear fruit. Spotting distinct sell signals can be difficult if you just use one form of technical analysis. But when you combine candlesticks, volume, chart patterns, moving averages, and some personal preference indicators, it can lead to a high probability of catching a change in price direction . On Monday prices broke above the 200-day SMA on the major indexes, but by the end of the day the rally had fizzled. This produced a gravestone doji on the S&P 500 and a inverted hammer on the DJIA. 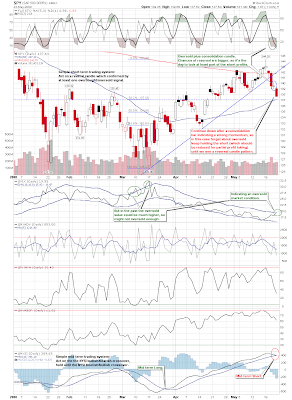 The sell signals were confirmed last Tuesday on May 20. The reversal allowed a head and shoulders top to develop on the S&P's 500 10-minute chart. The following day (Tuesday) a right shoulder appeared completing the pattern on the S&P 10-minute chart, while the gravestone doji was confirmed a prices pushed below its lowest point on the daily chart. 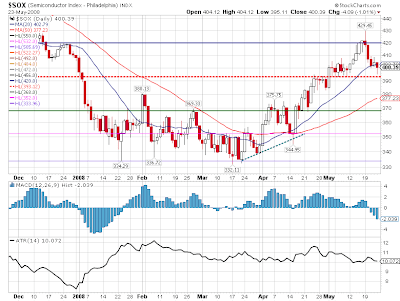 The DJIA confirmed the signal to go short, by breaking its rising trend in the daily timeframe. That was all I need to know! It was time to go short. 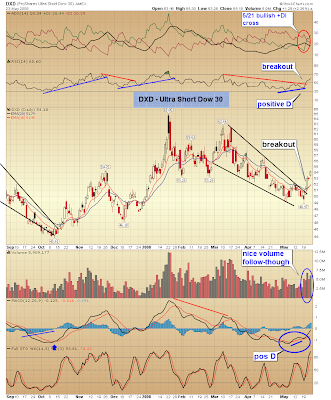 These signals gave us a timely entry to play the ultrashorts, by buying the breakout of a falling wedge on the Ultra Short Dow 30 (DXD). And then taking positions within the falling wedges in two other ultra shorts, the Ultra Short S&P 500 (SDS) and the Ultra Short QQQ (QID). After just 4 days DXD rose a whopping 7.25 %, while SDS climbed 6.15 %, and QID gained 4.5 %. But as my usually practice, I always sell 40 to 50 % of a position when a huge percentage jump occurs. Thus, I will be looking to find another entry point after the next reaction has concluded. 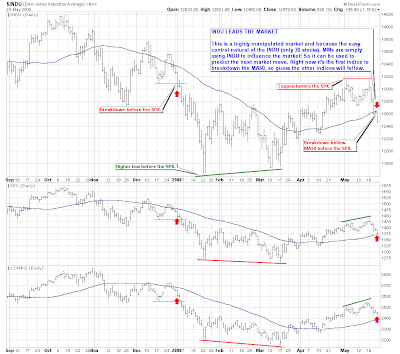 The inability of the indices to break above the 200-day SMA, shows a lack of conviction on the part of buyers. Both the S&P 500 and the DJIA broke down from two patterns on their daily charts this week. First they broke their rising trendlines (the lower portion of their rising wedges), and then they broke horizontal support. The horizontal levels of support at 12,715 on the DJIA and 1383 on the S&P 500, were the confirmation lines of their double top patterns. When they were violated last week, it signaled that the bears had taken back control of the market. Moreover, the DJIA is now underperforming all the major indexes. The optimistic sentiment two weeks ago has reverted back into 'the US is on the brink of a recession' mentality. This pessimism comes on the heels of crude oil prices reaching 135 dollars a barrel, with speculation of the price of a barrel of oil rising to 200-300 dollars and gasoline rising to 12-13 dollars a gallon. Famous trader Jesse Livermore found that whenever a stock or commodity crossed above 100 for the first time, it nearly always keeps going up for 30-50 points (my emphasis). And that is what has taken place in crude oil. Prices are unsustainalbe at these levels and will ultimately come down. 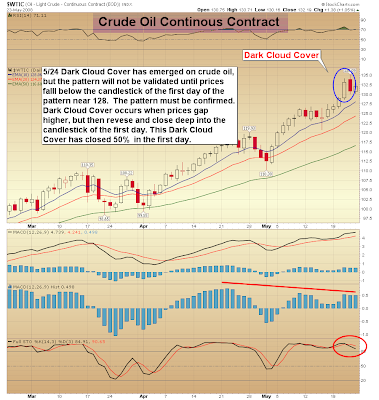 Incidently, crude oil did get a dark cloud cover bearish candle pattern on Thursday, but the pattern has not yet been confirmed. Crude oil futures are at unsustainable levels, just as the internet bubble was in the late 1990s, and more recently the housing bubble and Shanghai Stock Exchange (which has lost over 50 % since the October highs). This is nothing more than what former Fed Chairman Alan Greenspan once called 'irrational exuberance,' which was a cryptic warning that the stock market was overvalued. Pessimism reemerge after the release of the Fed minutes voiced concern for inflation, higher unemployment and lower expectations of GDP growth in 2008. The Fed expects the economy will grow at a pace of 0.3 % t 1.2 % in 2008. Personally, I don't believe that the US will get a recession from high crude oil prices. 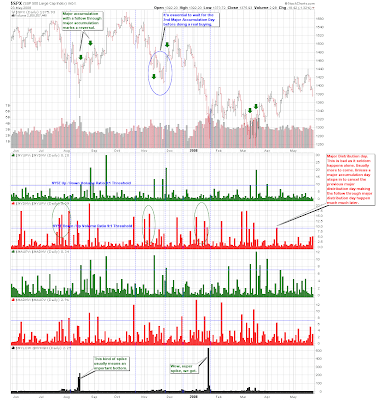 However, technical traders got some great signals this past week to capitalize on the recent recession pessimism. But the most powerful recent signal was that the volatility index (VIX) reached levels of complacency near the October lows. Oil executives were demonized on Capital Hill this week, once again accused of price gouging. The public has misplaced their anger towards the oil executives, because prices are set by supply and demand not by oil executives. But future speculators are adding fuel to the fire, driving prices up to nose bleed levels. This is not a case of price gouging but of future traders gone wild. The future speculators will ultimately be carried out the door when oil turns lower, just as speculators were in the other bubbles. But rather than future traders gone wild, the real culprits are the US politicians! We should cast blame on them for failing to tap into our own natural resources and literally ignoring the second largest oil discovery in decades. The Arctic National Wildlife Refuge (ANWR) will provide the US with at least 1 million barrels of oil a day. Yet the politicians who are beholden to radical groups, chose to blame big oil, when it is their energy policy that is driving crude futures higher. The US consumes 20 million of barrels of oil a day, 12 million barrels are imported. Drilling done in the US will occur with an environmentally friendly conscience, in contrast to what occurs in many other countries. The US doesn't mind buying the oil from countries who trash the environment, and are not good stewards of world, rather than drilling for it themselfs. The US has higher standards for drilling and would be good stewards of our natural resources. Regardless of where the US gets its oil from, our appetite for 20 million barrels a day is not going away. Many Americans have misplaced their anger, casting blame on big oil for rising energy prices. Some spewing hatred for oil companies making record profits. It is a lack of supply that is driving prices higher, not price gouging. Big oil wants to drill, expand, and refine oil, but the US government has prevented them from doing so, thus shrinking supply. To say that oil companies don't want to increase production is absurd. They would love to grow, which would increase profits for their shareholders. They are in the business to make money. Oil companies make .08 cents a gallon on gasoline, that's what they make for bringing you their product. The Federal Government makes 18.4 cents a gallon, in combination with state and local taxes brings the total tax per gallon to approximately .40 to .60 cents per gallon, depending on which state you live in. And they are complaining about how much money the oil companies make. If they want to lower the price of gas, why not simply remove the gasoline tax burden that has been placed on the American consumer. So what is the answer? Now, you have to ask yourself, have bio fuels helped drive down the price of gasoline? They haven't! Furthermore, I don't think ethanol is the answer because so much energy is used to produce it, being almost counter productive. I think it does more damage than good. Incidently, there is one politician who is offering some ideas to solve this problem. To Barack Obama's credit, he is the only presidential candidate who has vowed to look into the possibility of nuclear energy to decrease US dependancy on foreign oil. France is a country that has shifted to a nuclear energy policy, and is almost 90 percent completed with their nuclear program which began in the 1960s. Nuclear energy is working in France and it can work in the US. He is looking for breaks of 50-day MAs for the indices. I'm not sure how easy it would be to manipulate the Dow given the market caps of the components; but if any index makes a significant break - then there is a good chance others will follow. So will the Dow lead here? Lots of complacency in the market with respect to trading volumes (or is it just vacation trading?). Not the kind of rally to inspire confidence. 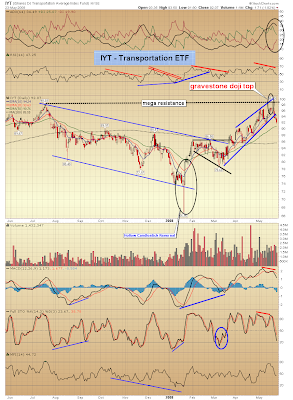 5/22 -- Today's little blip did nothing to the bearish short term case. The Dow made a sideways exit from its ST mini downtrend, but all the others remained in trend. Not only that, but they touched upper channel lines and did not have enough oomph to break...so, that suggests more downside tomorrow unless it breaks first thing in the morning. I'd say this whole move is a leg of a larger downtrend, so I would expect a bounce more meaningful bounce soon within that larger trend. 5/21 -- There is no doubt on the direction here, or that we've broken,or that its no longer possible we've just changed slopes. However, the Dow is the only major index to break in the 5-min, hourly and daily charts. The SPX only broke the hourly, the Naz and QQQQ broke only 5-min and hourly, and the RUT broke nothing yet! Nonetheless, we're in new short term downtrends in the 5-min and hourly charts and the damage on the dailies is that we've come back within the declining trend lines from last September...all of which says we have some downside momentum in front of us yet and that yesterday and today were probably the first leg of something larger. 5/20 -- I guess the people playing the VIX futures knew this was coming! Anyway, needless to say, we broke all the minis to the downside but did not really break the hourlies yet. I have drawn them in as slope changes (except for the Dow) as that is what it looks like so far. That means a bit more downside but not a collapse...unless we break the new slopes.